The general line of thinking is that More Tags = More Exposure = More Engagement. However, we strongly advise against this practice, as it's often counter-intuitive to your goal of more engagement. How, you might ask? In reality, tagging content more accurately, instead of focusing on breadth, is what increases engagement. This means that your content should only be tagged with the categories that relate to it the most. When this happens, only the people who are most interested in those chosen categories will see the piece of content. When you apply this practice to each subsequent piece of content, more and more of your subscribers receive the news they care about the most, leading them to engage more often. 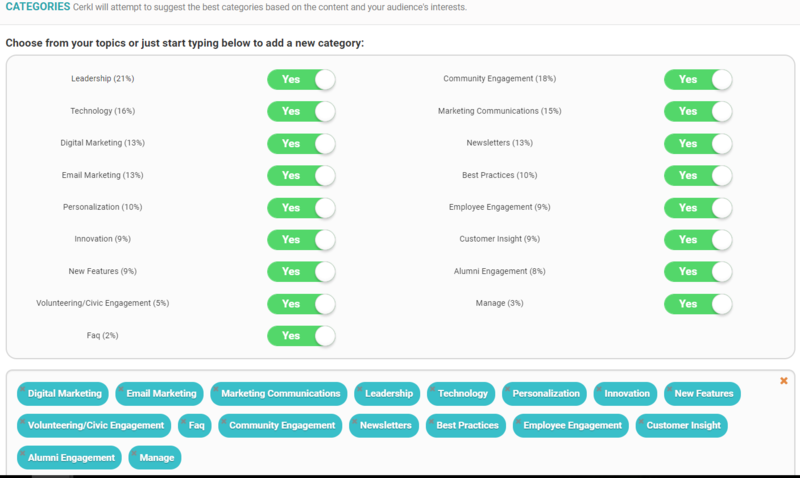 Since this content is tagged with Marketing-specific categories, those who are more keenly interested in Marketing will receive this content. This increased personalization of news and content is the reason why organizations that use Cerkl, experience Open Rates and Click Rates far exceeding national averages. Enhancing your organization's ability to personalize your subscribers' news and content is the best way to connect with your audience.